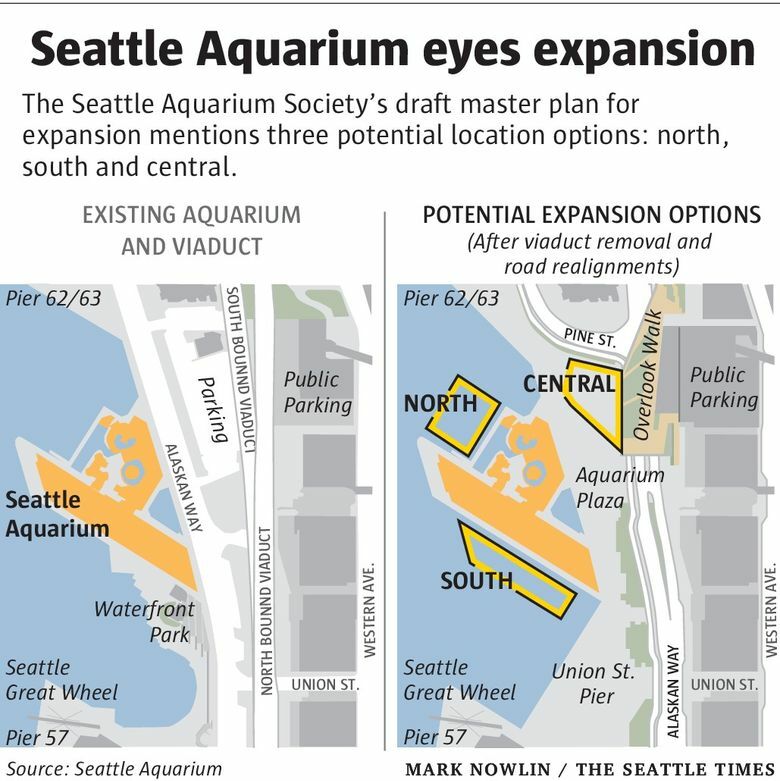 Planning has begun for what would be the Seattle Aquarium’s largest expansion and renovation since it opened in 1977. There's a public meeting at 6 p.m. Tuesday. The 38-year-old Seattle Aquarium drew about 810,000 visitors last year, more people than attended Seahawks home games. But an expansion would allow the aquarium to accommodate hundreds of thousands more annually, according to the nonprofit organization that runs the city-owned venue. The Seattle Aquarium Society is telling officials to seize the moment, as they prepare to redevelop the entire downtown waterfront, by growing the fish-focused destination. The society will host a public meeting at 6 p.m. Tuesday at the aquarium to share its draft master plan for expansion and to solicit feedback. Later this summer, the organization will ask the City Council to accept a revised version of the plan. The council is expected to give the society the green light to move ahead to the next stage of expansion planning. But some controversy is bubbling below the surface. The League of Women Voters has been lobbying council members in recent weeks to eliminate an option that would likely block views of Elliott Bay from Waterfront Park. “Our contention is that the south option is just not acceptable and should be taken off the table immediately,” said Nancy Bagley, of the league’s waterfront committee. There have been other proposals for expanding the Aquarium, which sits on Piers 59 and 60. In the 1990s, a plan called for a new building on Pier 62 and Pier 63. But opposition from waterfront condominium owners worried about the new structure blocking their views scuttled that scheme, according to the society. The next plan suggested that the aquarium expand north and south, over the water. The concept was shelved when the 2001 Nisqually earthquake turned attention toward a shaky seawall and the Alaskan Way Viaduct and when the dot-com bubble burst. In 2007, the aquarium underwent a $41 million renovation on Pier 59 that included a new entry hall with 18,000 additional square feet and new pilings under the pier. Last year, the venue wrapped up a $6.5 million remodel of its outdoor harbor-seals exhibit. The latest plan imagines quite a bit more, including as much as 75,000 additional square feet. The leading option would have the aquarium construct a new building on land east of the existing venue rather than expanding north or south over the water. The upland building would feature animals from the tropical Pacific Ocean and would be incorporated into the broader redevelopment of the city’s downtown waterfront. Seattle officials hope to transform Elliott Bay’s edge into a breezy, park-dotted pedestrian promenade after the viaduct is removed — something that’s been delayed because the machine digging a highway tunnel to replace the viaduct is broken. The space eyed for the upland building is now separated from the aquarium piers by Alaskan Way. But once the viaduct is no more, the aquarium could span both sides of a pedestrian plaza, and the upland building could nestle at the bottom of Overlook Walk, a pedestrian ramp connecting the waterfront with Pike Place Market. The aquarium needs a larger, modern Tropical Pacific exhibit so it can better educate visitors about the deteriorating health of the mighty sea, Davidson said. The existing exhibit is cramped, even though the society is taking part in research projects related to the Pacific, including work on ocean acidification, he said. “We’ve got to tell the story of the Pacific Ocean and oceans in general,” Davidson said, adding that the new building would house sharks, which are popular with visitors. The aquarium’s aging Pier 60 wing, under the latest plan, would be renovated and expanded to house permanent Outer Coast and Puget Sound exhibits. Its Pier 59 wing would be remolded on the western side to allow visitors to gaze out across Elliott Bay. The entire project could cost as much as $200 million but likely would be completed in phases, Davidson said. The first phase could cost $100 million, he said. The city covered about half the cost of the aquarium’s last major project, the Pier 59 job completed in 2007, and the society is counting on more help, Davidson said. In its 2012 Waterfront Strategic Plan, the city penciled in a $45 million contribution. Mayor Ed Murray last year cut that estimate to $34 million, citing the tunnel delay. If the council adopts a resolution this summer accepting the society’s master plan, the organization will continue toward schematic design and environmental review. The draft master plan identifies the upland site, also called the central option, as a “strong candidate for expansion.” The north and south options would be more challenging and expensive because they would involve building over the water. Various city policies protect public views from parks, waterfront views in particular, and views of landmarks like Pier 59, said Bagley, from the League of Women Voters. The society’s 20-year agreement with the city, signed in 2010, requires that the master plan for expansion include a strategy to preserve view corridors, she added. The current, 4.8-acre Waterfront Park is a concrete and boardwalk wasteland, but its views are stunning and the space is part of the city’s redevelopment vision. The society needs to retain the south option as a backup, no matter how good the upland site looks at the moment, Davidson said. “We can’t lock ourselves in,” he said. The society’s draft master plan suggests timing the aquarium expansion to begin construction at the same time as Overlook Walk, in 2019.